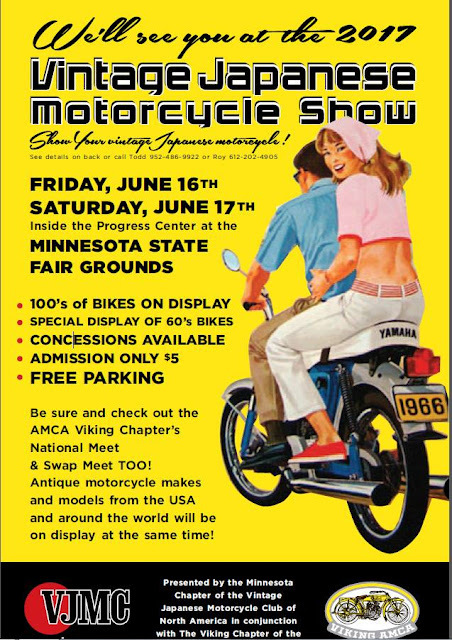 This image (yellow background, couple on a Yamaha) was chosen for the back of this year's T-shirt and became the flyer for this year's VJMC Show, Minnesota Chapter. As our President Todd mentioned to me, 200 bikes did get registered, confirmation of our claim of "100's of Bikes.....". Actually, the final tally was 215 entries, 80 of which belonged to our local VJMC members. ....and the big 24" adjustable. My friend Steve introduced me to Paul who has a great deal of fabrication experience and skill. Here he was describing how he needed a fender ornament that he did not have, carved a wooden mold and cast his own emblem (not on this bike, but one just like it). Much like the fender emblem, one of Paul's NSU bikes was missing the air cleaner box (left side of photo and the tool box (right side). He formed his own, copying the originals. The posters!! I just couldn't get enough of the posters!! Lee Roy Mitzel once again brought just a few from his fantastic collection....incredibly fine, some extremely rare and all wonderfully shared for us to get a good look at. Ron and Stan....not exactly sure.....it's nothing like any of their machines. Not sure about its power output but if decibels equate in any way, this thing could launch the Space Shuttle. These always catch my eye....this one's for sale and I'm trying not to think about it. Another one of Scott's extremely Fine fabrication projects; this one a Honda GB500. You've seen some of his other bikes in my other Postings. The Gladius most recently and his Guzzi previously. He's got years and years of metal and fiberglass bodywork under his belt. The Judges in process.......I don't know how they do it! This Indian is a 3/4 size, built for clowns.....REAL clowns. An I.V. stand, complete with a couple of bottles of Castrol keeping this BSA well fed and alive....I had another photo of the bottles but lost it somehow. Didn't pick anything up, eh? Richard, I did not but it's amazing how powerful temptation can be!! That is a lot of interesting looking motorcycles! Dom, there are some amazing collections/machines out there. So many beautiful bikes. I love the vintage shows. That white CB450 sure is pretty. Does it seem ironic that Lucas Electric was met with "resistance"? Besides the admiration for the condition of the machines, the memories of times past really do come to life by being able to see what was. Thanks for sharing your pictures of the event...they are great! Thank you C.B., appreciate you saying so! A place to share my rides, photos, musings and anything else that may come up. The Man straightened stiffly above the block of salt fixed to the stake and looked at the young cattle ringed about him. The pasture was holding out well and the stock was looking good. This bunch would be ready to sell in another month, maybe sooner if the market was right. A stir among the cattle down near the river brought him round to face the swinging bridge he'd built years before. Someone was coming toward him from the bridge. Someone in breeches, but it didn't look like a man, somehow. What was a woman doing in his pasture this time of night? He bent over the salt again; maybe if he paid her no heed she'd go on past and let him mind his own business. He heard her footsteps come nearer and stop. "Good evening," she said. Her voice was smooth with book learning but friendlier than most, and somehow almost shy. When he made no answer she went on, "I've been sitting on your swinging bridge....I thought I'd like to say thank-you...." Her voice stumbled a little, then she tried once more. "You are Mr. ____". His name sounded strange in her voice, but she went on to tell her own. "That's what they've called me the last sixty-eight years," he said, looking past her face to the hills fast darkening under a single star. "I reckon the woods are free for those that like to walk there." The unfamiliar voice laughed a little. "That's what Emerson said: the grove belongs to the man who walks in it with an open heart....On that basis I guess I've owned part of your woods for a good many years.....". She made a final effort. "I've always wanted to thank you....."
Something deeply hidden stirred in him. "There's a stump up there, in the notch of the woods", he said slowly, "that before the timber grew so tall you could stand on it and see all over this country." He kept still a minute, remembering, then, "I used to stand up there an' look at things, an' wonder how they come to be like they was, an' how the hills was created, an' all the things in Nature.... I told my wife I guessed all the religion I ever had I got standin' on that old stump, a-wonderin'..." He turned his face away from her. She helped him out. "I know about that, a little. This afternoon I saw......." Her account of a thing she had really taken time to look at eased him, and he answered with telling of the badger den at the foot of the swinging bridge. When she had gone, he turned to watch her. After a moment she stood clear and unmoving against the sky. You could hear the sounds of the river where she stood. She was one that could stand still long enough, he thought, really to hear what a body was saying, or a river.